Tremadog, Porthmadog, Criccieth & Beyond! If you would like to be added to our mailing list, simply drop us an email from the Contact page - All you need do is add NEWSLETTER in the message box. Audience participation is welcome and attempted wherever as possible! Over time we'll be adding past and new pictures to the gallery, You'll be able to see the various individuals from there, not to mention the Visitors. Oh - Did I mention " We love Beer"
First thing to note is - This is a session & not a gig. Sessions are not amplified (Though to be honest we can be loud enough when we need to be) and are far more informal. The Travelling Session requires one thing at a venue to keep it going...Beer - yes, we play for beer! and guess what - We don't drive to sessions, so if you want us and it's not a bus ride away(or back) then you'll also have to fork out for the taxi/minbus! We tend to play on Tuesday Nights but can make exceptions from time to time and with plenty of advance notice. 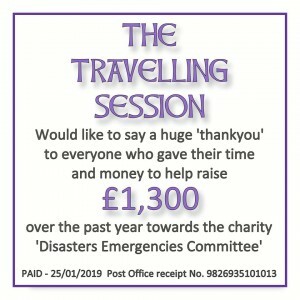 Following on from the outstanding success in 2018 - (dedicated to The Disasters & Emergency Committee - £1300 Collected) We have decided to sponsor two National/International & two local charities in 2019 (each receiving 25%) - Links to all the charities new and previous can be found on our Charity Page. We would like to thank both Musicians and Audiences who have given so generously and hope this continues into 2019 and beyond!